a.m. on Monday, March 6. 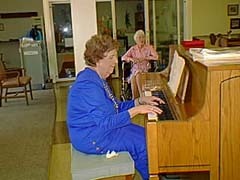 Eighty-four-year-old Vi Schmidt is making her monthly, voluntary appearance to entertain the residents with her piano playing during their lunch time. 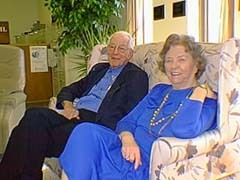 Vi and Les Schmidt settled in Lincoln right after marrying in 1934. Les worked in the Lincoln post office for many years and served as assistant postmaster from 1956-1968. They have two children, a daughter, Carol, and a son, Elvin; nine grandchildren; and 14 great-grandchildren. She later began to impart and spread her talent to others by giving piano and organ lessons in her home. She had as many as 60 regular students at one point. Vi also served as the organist at Immanuel Lutheran Church for 35 years.